Mecca Bingo is one of the best known names in bingo and originally started with its nationwide bingo halls and more recently its fab online bingo site. Virtue Fusion provides the software that powers the games at Mecca. There is no download to play at Mecca Bingo you just need to create an account and you can get playing. You will need to supply a few personal details, choose a username and password as well as choosing a secret question you are asked to provide payment details upon registration but you needn't make a deposit there and then. Funding options at Mecca Bingo include Solo, Switch, Maestro and Visa debit cards, Visa and Mastercard credit cards, Laser, Ukash, Moneybookers and Neteller. Mecca Bingo offer 90 ball, 80 ball and 75 ball bingo and if you visit the online bingo schedule you can check out what each room has going on all day long including the ticket prizes for each game and the prize total. The game names are funky and generally themed like 'Time For Lunch' which is you guessed it, lunchtime! Tickets start at a reasonable 5p. The Lobby gives you a clearer of what's on now and shows, ticket prices, number of players, prize and when the game is due to start. The bingo rooms are bright and vibrant and everything you need to know about the game is clearly displayed. The calling is basic but fast paced so no time to get bored there. You can opt to play a number of great mini games whilst playing bingo including,scratchcards, number games and slots. The chat room is very friendly and everyone was very encouraging, you get the impression a lot of the people know each other or are regular fixtures on the site. The CMs are very chirpy too and very helpful. Mecca has a support team on hand 24/7 to answer your questions via live chat, email and free phone number. There's also a really detailed Help section to browse through too. 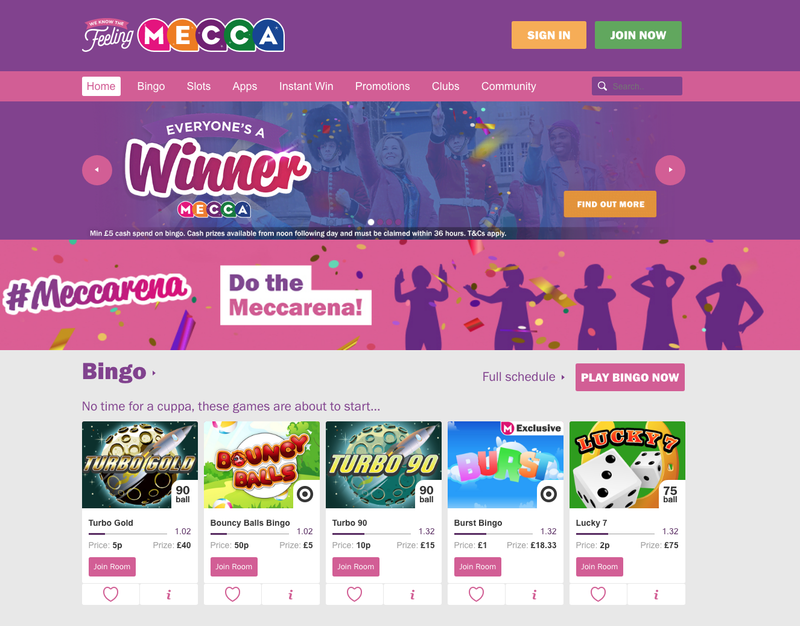 There's a real sense of community at Mecca with a section introducing you to their CMs, a community forum, bingo jokes and help to get you started if you haven't played before and you can even leave your feedback about the site too. There's plenty of choice from bingo to casino games, slots, keno and other number games, something for everyone really. The customer service is very good and they take good care of you whether your problem is big or small. Everyone has heard of Mecca Bingo and for good reason, they have a good reputation and I'd recommend their site to anyone. No, you are not required to download this bingo game, there is an instant play version at Mecca Bingo. No, Mecca Bingo does not offer a downloadable version but you can play instantly on the site.